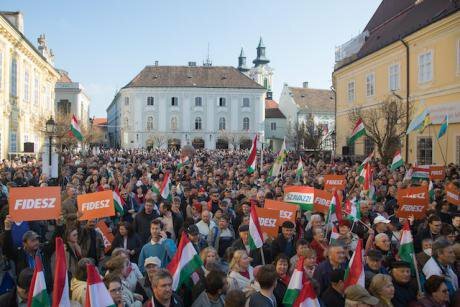 Fidesz supporters take part in the last rally of the Fidesz party before general elections in central Hungary, April 6, 2018. Attila Volgyi/Press Association. All rights reserved. The end of 2018 was not uneventful for Hungary and Viktor Orbán’s Fidesz party (Fiatal Demokraták Szövetsége; Alliance of Young Democrats). Increasingly strengthening their hold on Hungary, in the April 2018 national elections Orbán and his party again succeeded in attaining a majority government, now essentially wiping out the opposition and effectively creating a one-party state. The elections were followed by several red-flag events (which I covered here and here), including the creation of a list of ‘Soros agents’, the criminalisation of ‘helping migrants’, and a crackdown on NGOs and intelligentsia. Protests have been ongoing in Budapest since December 2018 against the new ‘slave law’, a law stating that individuals can be required to work 400 hours of overtime to only see payment in three-years time. Protests involving thousands resulted in a sit-in by Hungarian opposition leaders and representatives at a local television station, demanding but five minutes of airtime to voice their concerns; the sit-in was live-streamed on Facebook (in several videos, for example here) by ex-LMP (Lehet Más a Politika; Politics Can Be Different) leader Bernadett Szél. Opposition leaders and representatives were eventually ejected from the building the following day without succeeding in securing airtime. The question is, was this ‘slave law’ smoke and mirrors for the arguably more serious events going on in the background? While people were on the streets protesting this new law, Fidesz swiftly passed a law allowing the creation of a new administrative court system with judges to be appointed by Fidesz. These administrative courts would take over cases dealing with elections, taxation, and protest. Needless to say, this does not bode well for the future of the freedom to protest and any chance of a change in government in Hungary. When putting it all together, it paints a bleak picture for Hungary: a war on the intelligentsia, a complete takeover of the media, and a law that has criminalised ‘helping migrants’, almost immediately followed by the creation of new government-controlled administrative courts. While one should not jump to hyperboles and extremes, for many Hungarians it is difficult not to liken the current atmosphere in the country to the regime of the Kádár era (1956-1989). How right-wing are Fidesz supporters? Are the Hungarian people really so right-wing? Has Fidesz’ propaganda succeeded in indoctrinating so many? Prior to Fidesz taking over the radical right sphere of politics in Hungary, that terrain was in the firm grip of the Jobbik party (Jobbik Magyarországért Mozgalom; Movement for a Better Hungary). However, as Fidesz began a more notable shift to the right with their xenophobic and nativist characteristics, Jobbik took on a more centrist image. Since the national elections in April 2018, Jobbik has since fragmented, with a portion of the party forming the radical right Mi Hazánk (Our Home) movement. Yet, much of the scholarship and literature on the radical right in Hungary still focuses on Jobbik, while some Hungarian scholars have described the parties as being quite similar. A quick look at the survey data can reveal much about the states of mind of the Hungarian people. Using the European Social Survey, data from 2015 (Round 7) and 2017 (Round 8) was used to analyse political placements versus which party an individual most supports. More specifically, the survey analysis looked at a variable measuring where an individual would place themselves on a political scale, ranging from extreme left (0) to extreme right (10). This was then compared to which party the individual ‘feels closest to’. A simple analysis revealed a change from 2015 (Table 1) to 2017 (Table 2). Both the 2015 and 2017 data show the popularity of Fidesz and Jobbik, with Fidesz attaining 42.9% of support from survey respondents in 2015, and Jobbik 22.3%. In 2017, 62.6% of survey respondents felt closest to the Fidesz party and 14.2% to Jobbik. In both years, these two were the most popular parties. To examine the proportion of far-right supporters, values 9 and 10 on the political scale were considered as ‘far-right’. It must be remembered that these are self-placements on the scale, meaning that respondents identify themselves in this way (as opposed to being labelled by an external source). In 2015, 18.3% of respondents who felt closest to Fidesz were far-right compared to 37.5% of those who felt closest to Jobbik. In 2017, 28.7% of Fidesz supporters were far-right and 31.0% of Jobbik’s supporters. Looking at these numbers, it is clear that there is a rise in far-right support for Fidesz and a decline of far-right support for Jobbik, although it is still substantial. When comparing overall numbers, in the 2017 data 77.6% of far-right respondents supported Fidesz and 19.4% Jobbik. Table 1: 2015 Hungarian ESS Data (Round 7) of participants’ self-placement on a political left-right scale versus the party to which they feel closest. Table 2: 2017 Hungarian ESS Data (Round 8) of participants’ self-placement on a political left-right scale versus the party to which they feel closest. These results indicate a frightening shift not just in Hungarian politics, but among the Hungarian public. The implication is that Fidesz supporters aren’t just brainwashed and indoctrinated, but many actually self-identify as being far-right. It is clear that the Fidesz government is truly what the Hungarian people desire, their success not simply a matter of effective propaganda. Consequently, the continued focus of scholars and academics on Jobbik deducts from the seriousness and impact of Fidesz, and the amount of damage Orbán’s party has caused. Jobbik may have paved the way for the contemporary wave of fascism in Hungary’s parliament; however, they are now extremely small fish in the Hungarian political ocean, which is now completely polluted by Orbán’s regime.